As amazing as it is to be able to effortlessly relocate to a new European city or country for the weekend, I’m sure many can relate to the stress that comes with having to fit all the excitement and activities of a city into one short weekend – especially when we only have one full day. 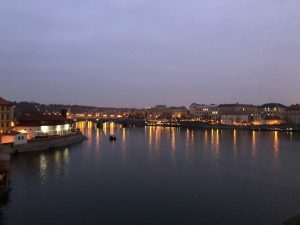 Upon my late arrival in Prague, I was disappointed when I realized how little time I had to explore the city, and unsure how I was gonna fit in all the things I wanted to do and see. However, by coming to terms with the fact that I wouldn’t be able every single part of Prague, I was able to really enjoy and savor what I did get to see rather than rush through as many things as I could fit in. 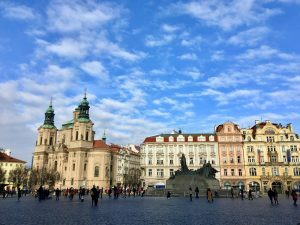 I chose a few things I really wanted to do and set my mind to taking my time and allowing myself to notice and enjoy the quirks and details of the streets of Prague. I knew for sure that I wanted to go to the National Gallery, the museum with the largest art collection in Prague, and the infamous John Lennon Wall. Besides that, I allowed myself to wander and explore whatever caught my eye. In doing this, I was able to stumble upon many things I wouldn’t have thought to visit otherwise. What ended up being my favorite part of my trip was climbing to the top of the St. Nicholas Bell Tower, an old bell tower with a wrap around balcony that gives you 360 degree views of Prague. I was also able to eat traditional Czech food at a hole-in-the-wall restaurant and take time to observe the intricate and easy-to-miss (if you’re not paying close attention) details in the old buildings and streets. Although it’s tempting to pack every tourist attraction of a city into one weekend, I recommend carving out some time to let yourself explore and stumble upon sites you otherwise would have skipped.